(Vancouver, B.C.) Wheelchair Basketball Canada congratulates Peter Colistro, former Canadian Men’s National Wheelchair Basketball player, on his induction into the Basketball BC Hall of Fame. Colistro joined the class of 2016 in the athlete category at the awards gala which took place on May 14, 2016 in Vancouver. Throughout his career, Colistro represented Canada at three Paralympic Games (1976, 1980, 1984) and two world championships (1979, 1986), helping the team secure silver in 1986. He is also a two-time Paralympic medallist in wheelchair athletics. A force to be reckoned with on the Canadian courts, Colistro played for the Vancouver Cable Cars from 1971-1986. 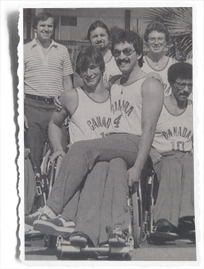 The Cable Cars were one of the most dominant provincial clubs in Canadian wheelchair basketball history and Colistro was a part of the team that won six straight national championship titles. Colistro was also one of the first directors and founders of the BC Wheelchair Basketball Society, giving back to the sport and community. He was inducted into the Canadian Wheelchair Basketball Association (CWBA) – now Wheelchair Basketball Canada – Hall of Fame in 1997.